The M2 "Long Tom" was the mainstay of Army corps level artillery in the latter stages of WWII and the Korean War. This gun could also be mounted on a M40 or M43 self propelled gun carriage. The "Long Tom" was known for accuracy at long Range. The 155-mm guns Ml, M1A1, and M2 can be mounted on either the Ml or M1A1 gun carriages. 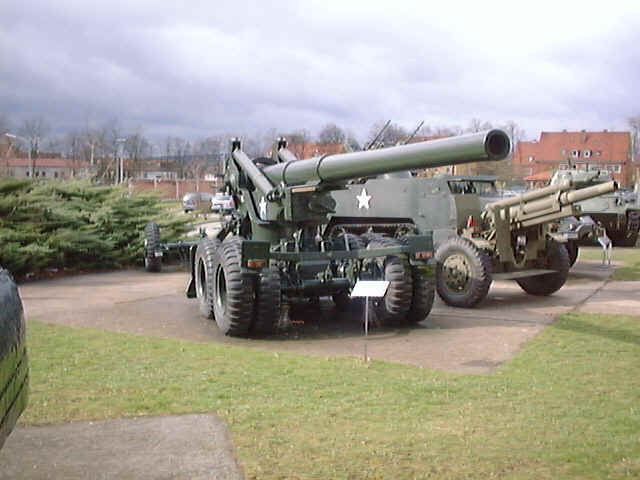 The 155-mm guns Ml and M1A1 are identical with one exception. The 155-mm gun Ml has a breech ring bushing inserted in the breech ring. The breech mechanism female threads are cut in the breech bushing. The 155-mm gun M1A1 does not have a breech ring bushing; the breech mechanism female threads being cut directly in the breech ring. The 155-mm gun M2 is similar in construction to the 155-mm gun Ml, i.e., the breech ring is fitted with a breech ring bushing and the breech mechanism female threads are cut in the breech ring bushing. In addition the 155-mm gun M2 has a slightly larger powder chamber than the guns Ml or M1A1. The 155-mm gun M2 is used as a heavy field weapon and is also classed as secondary armament for seacoast defense. The 155-mm gun M2 is mounted on three types of mounts, namely; the heavy field carriage Ml or M1A1, gun motor carriage T83 and the firing platform Ml. The 155-mm gun carriages Ml and M1A1 are heavy field carriages and are equipped with a bogie assembly at the front of the carriage, which is used to lower the carriage to the firing position and also to raise the carriage to the traveling position. The carriage is limbered by either the heavy limbers M2 or MS, or it can be towed without the use of the limber by being semi-trailed. When emplaced, removable spades are installed on the carriage and on the rear ends of the trails. Air brakes are provided for use during transit, and hand brakes are applied on the front bogie wheels when the weapon is parked. The firing platform Ml is a circular platform designed to enable all-around fire. When mounted on the firing platform Ml, the same materiel is used that is used with the heavy gun carriage Ml and M1A1. The weapon is rolled up into place and anchored on the bolster in the center of the platform. The gun motor carriage M40 provides a highly mobile heavy artillery unit. When mounted on the 155-mm gun mount M13 for mounting on the gun motor carriage, only the gun, recoiling parts and top carriage of heavy field materiel are used. The recoil mechanism is a hydro-pneumatic type with a variable recoil feature to offset differences of recoil at various degrees of elevation. The 155-mm gun M2 may be equipped with either the firing mechanism Ml or the firing lock Ml7. Separate loading ammunition is used, which is loaded and rammed into the gun by hand. The 155-mm gun carriage Ml is. the standard carriage for these guns. The M1A1 carriages were the original test models re worked to be practically identical with the Ml carriage. Differences that remain between these two models are manufacturing details. The heavy carriage limbers M2 and MS are entirely different in design and operation. The French, who had lost 377,000 at Verdun alone, were more than willing to share their artillery with the exuberant doughboys whose eyes were still unscarred by the wanton slaughter of modern warfare and whose biggest field piece was the 3-inch howitzer. One of the ordnance pieces lent by the French was the 155-mm gun, called the Grande Puissance Filloux (GPF)—literally "Filloux's gun of great power." Weighing 25,500 pounds underway and 20,100 pounds in firing position, it could hurl a 95-pound explosive shell over 17,000 yards. Its official adoption by the American Expeditionary Force (AEF) came, when the US Army labelled it the M1917 155-mm gun. The subsequent M1918 was merely an American-manufactured version of the French gun. All one had to do to transform a GPF into the M1917A1 was to fit an American breechblock to the French gun. Expertly handled by doughboy crews, this gun—sometimes referred to as the 155-mm rifle—pounded the German lines. The memory of the Frenach 155-mm gun's uncanny accuracy, long range, and destructive prowess was still fresh in the minds of cannoneers when they were queried by the Westervelt Board just months after the Armistice. This group of ordnance and artillery officers had been convened to canvas its own and foreign artillerymen as to the relative merits of different cannon, as well as what they envisioned would be most desirable on any future battlefield. One of the Board's recommendations, submitted on 23 May 1919, called for a new improved 155-mm gun, with the extra proviso that a self-propelled version also be developed. Since the Board's specifications for both the 155-mm gun and the 8-inch howitzer were nearly identical, the ordnance planners — faced by the inevitable shortage of research and development funds once the fighting stopped — decided to design a single carriage capable of mounting either of the two new weapons. The newly designed 155-mm gun measured 22 feet, 10.7 inches long (not including the breech), weighed 9,200 pounds, and could fire a 95-pound projectile over 26,000 yards. The resultant dual-purpose carriage, along with the new 155-mm gun and 8-inch howitzer, was designed as the M1920E. Spring suspended, the carriage alone weighed 18,800 pounds. The maximum elevation was 65 degrees and total traverse was 60 degrees for the 155-mm gun, while the Filloux type variable recoil mechanism permitted a maximum recoil of 60 inches and a minimum recoil of 24 inches. The carriage's hard rubber tired wheels, while adequate for the slow moving tractors then used to move field artillery, made it obsolete for any fast-moving mechanized army. The carriage proved unstable when the gun was fired at maximum power, and, as an additional handicap, the M1920E model had been specifically designed to be divided into two separate loads for transportation, particularly when crossing bridges. The Ordnance Department tinkered with several other experimental carriages during the 1920s, but without success. Then, in the summer of 1930, Rock Island Arsenal developed the radical split-trail T2 carriage which contained at least two "firsts" for heavy field artillery carriages: an all-welded construction and a unique 8-wheel (four dual tires) roll-bearing bogie that permitted the gun to be carried on truck wheels cross-country at high speeds. For stability in the firing position, special built-in jacks (which eliminated the need for a crane) dropped the bottom carriage to the ground. This T2 carriage survived for over 30 years without any major modification. Meanwhile, both a new 155-mm gun and 8-inch howitzer had been designed to share this radical T2 carriage, being type-classified standard as the M1 in July 1940. The M1 155-mm gun soon gave way to the improved M1A1 in June 1941 which, in turn, was superseded in March 1945 by the M2 (model designation changes reflected the different type construction of the tube and breech ring). On 9 August 1945, the unconverted M1 and M1A1 were declared obsolete. The United States, still reeling from the catastrophic effects of the Great Depression, however, did not feel it could afford the luxury of big expensive guns; therefore, only 65 Long Toms were built before 1941. Left over from World War I, however, and still carried on the army inventory were 908 French GPFs, some of which had been modified for high speed towing. The Long Toms quickly earned the respect and admiration of all that came without sound or striking range of its mighty blast. In the war years to come, both the European and Pacific theaters were to witness its accuracy and deathly punch. But, it was in the brown-hued landscape of North Africa that the Long Toms first revealed their awesome, accurate firepower in combat. Ironically, because of the tight security surrounding the preparations for Operation TORCH, the ammunition requisitioned from the States was for the old World War I GPF rather than the new M1 155-mm gun, with which the US II Corps was equipped; thus, the M1s were left behind in England and missed the initial phases of the North African Campaign. American-crewed Long Toms not only fought alongside the GIs of every American division that saw combat in North Africa, but also served for two months with the British army. While serving with the Royal Artillery, US cannoneers and their Long Toms were utilized as reconnaissance-in-force units. On numerous occasions in December 1942 and January 1943, the Long Toms and their US handlers found themselves on Hill 609 with only a mere company of British paratroopers for local protection. An armored car, meanwhile, would probe some 10 to 15 miles out front into enemy territory and, when it drew hostile fire, the Long Toms immediately retaliated. On 18 January 1943, for example, a battery of four Long Toms expended 368 rounds in this fashion in a matter of just a few hours. The accurate and long-reaching heavy punch of the Long Toms was in great demand during the hectic fighting in North Africa that transformed the "green" GIs into seasoned veterans. They were rushed to the Kasserine Pass to support an armored counterattack, following the American's disasterous defeat. Later, a battery of 155-mm rifles, after getting the worse of a counterbattery duel, withdrew across the Medjerda River and occupied an Arab cemetery. Here, the Long Toms fired for 18 straight days without being detected by the enemy, although both their old positions, as well as a dummy position just 800 yards away, underwent heavy shelling and bombing. Then, on 23 March 1943, a forward platoon of 155-mm guns shelled a German airfield near Maknassy, destroying five planes — probably the first ever to be hit by a Long Tom. As for the crews of the 155-mm guns, they soon came to appreciate the strength and effect of their heavy projectile. For example, at Medjez, just one of their rounds landing 80 yards from an enemy battery caused its prompt relocation. And, on another occasion, they dropped a single shell in the midst of a Panzer tank concentration, only to watch it immediately disperse. One lesson learned in the Africa campaign in 1942 was that tractors were too slow. British staffs were more painstaking than the Americans in setting requirements for the six-mile-per-hour artillery columns, but the Heavies were often asked to make impossible moves. Two batteries were rushed to the Kasserine Pass to support an armored counterattack. When the battalion supported armored divisions — it did so repeatedly — 10-ton wrecking trucks were borrowed as prime movers. Shuttling was generally necessary and the units to whom the borrowed prime movers belonged objected, and the tractors were sometimes left far behind. In general, life for the battalion staff was made a burden by lack of organic high-speed prime movers. Another lesson in regard to traction was that wheeled vehicles as prime movers are not enough. It was near Gafsa, and the only possible position for one of the batteries was in a wadi (a dry stream bed) which shelved half-way down and then had a central channel. All night it rained. Two of the guns were on the shelf of the wadi and some transportation was concealed in the channel. At 0630 hours next morning, without warning, a 4-foot wall of water hit the battery, inundating it and burying one weaponscarrier (mounting a 37-mm gun) to the windshield. The battery was immobilized all day until the ground dried out enough for trucks to get some traction. Had the battery had a caterpillar tractor, towed to the position on a tank-carrier behind a fifth truck, the guns might not have been immobilized. In an orchard near Medjez a tractor and gun were stuck in the mud so badly that mud rolled up over the wheels of the piece and the wheels no longer turned. Another tractor was hooked up in tandem, and snaked the gun out like a log. While it is not recommended that two tractors be carried around by each battery, the need for one seems well established. Peeps proved much better than C&R cars, doing all that the larger vehicle could do and not being so conspicuous. On several occasions higher authority set a line beyond which nothing bulkier than the peep, except ambulances, was allowed to move; an acute peep shortage set in. The battalion wants all the C&Rs replaced by peeps, with half-tracks added for liaison officers and FOs. The biggest headache of the campaign was wire. In one position 15 miles were out at one time, tying in the artillery of two divisions and the battalion's own OPs. With all the armor that moves about on a modern battlefront, the lines were cut up almost all the time. At the Kasserine Pass the armored division supported by the battalion provided the RO with a half-track and radio equipment, which proved exceedingly useful and demonstrated the desirability of that vehicle and that type of communications in forward areas. Of all things imaginable to happen to an airplane, the oddest yet occurred to one of the flying OPs of the battalion. It was blown up on a mine, just after landing in front of one of the batteries after a shoot. These planes were used a lot and with good success. Since the regiment was never together in the same sector, it is felt that the battalion is the largest sensible unit. For reasons of command and liaison it ws recommended that the regiment be broken down still further, and that the artillery of each division be reinforced by an organic unit of six 155-mm guns, to correspond to the 150-mm guns the Germans assign to their divisions. If attached to the division artillery section for administration and supply, the six guns could be controlled like a British battery and commanded by a major. Each platoon of two guns should have a lieutenant in charge. Especially in a defensive situation, the advantages of 6-gun batteries, to fire by platoon over a wide front, were appreciated by the battalion at Kasserine Pass and El Guettar. In each of these sectors a battery was reinforced by one platoon in order to provide the field of fire necessary to accomplish the assigned mission. The battalion learned that it does not pay to occupy the old position of another unit, even though it seems to be the best position around. There was little to be done about flash, which iwa visible for over 20 miles on a dark night, but it is not convinced that smoke rings, which sometimes go hundreds of feet in the air, are a necessary evil. Though the Sound and Flash boys were accused of trying to choke enemy patrols by jamming microphones down their throats, they found broken terrain a serious handicap. Finally, the battalion learned to know its own strength. It learned what it could do as a team of men, and it saw the good work done by its guns. It saw the morale effect of its heavy projectiles. At Medjez a single round was put down 800 yards from an enemy battery, and the battery lost no time in pulling out. On another occasion one round dropped inside a tank concentration caused it to disperse immediately. The men who served the Long Toms thought them the best guns in Africa, and they did a lot to prove it.